Repeat The other pics I had are too big. Ill send more later. I bought this car because it was my wife's dream car and the condition is pretty much complete aside from the paint job, brake conversion, airbag system upgrade, and a few other mods that will make it more our taste. We are taking the drag pipes off and smoothing out the lines, and setting up a fastening system for a Carson top. The paint job is going to be flat black with some classy pin striping and maybe some ghost flames in a different shade of black. I will be installing a retro stereo, and some good door poppers for the shaved door. If you guys have any insight or ideas I wouldn't mind hearing what you have to say. Thanks and good luck with all of your projects. The pictures don't do the car justice as the lighting in the shop is sub par. Now that's what I call a cool ride! 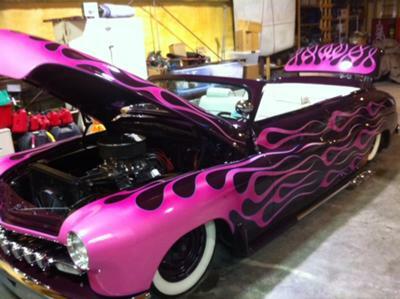 Apparently, Hot-Pink can be a cool color after all now that I see it in flames on top of a black finish. The all white interior puts this rod over the top! Very nice work and thanks for the post!